Delegates from six countries as they met at Sabina Park yesterday to establish a British West Indies Football Board of Control. Sitting at the table (clockwise) are Messrs. Francis DaCosta and William Husbands (British Giuana), the Hon. Dighton Ward, M.L.C. (Barbados), Messrs. Ken Galt and Eric James (Trinidad), Mr. Winston Meeks and the Hon. Douglas Fletcher, M.L.C., (Jamaica), Mr. Ken Antrobos (partly hidden) (St. Vincent), Messrs. E. Comissiong and B. A. Callender (Grenada). 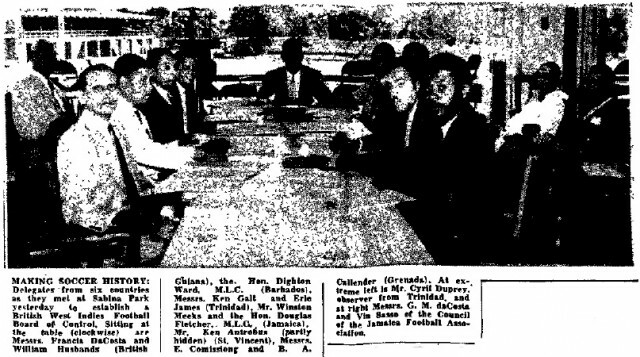 At extreme left is Mr. Cyril Duprey, observer from Trinidad, and at right Messrs. G. M. daCosta and Vin Sasso of the Council of the Jamaica Football Association.